Milkweeds are great flowers for attracting butterflies. Iowa has sixteen species of milkweed, and our property has six. 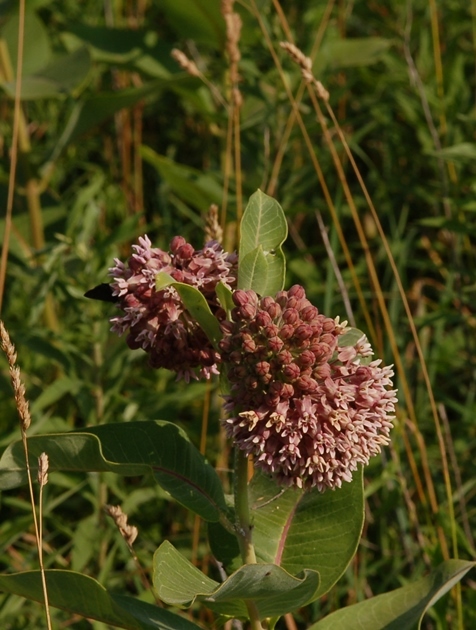 The most common is, as the name implies, common milkweed. I have found that hairstreaks are particularly attracted to milkweeds, and can usually be found by inspecting every milkweed around. Hairstreaks are generally difficult to find otherwise. I walked through our field tonight–we have hundreds of plants of common milkweed, but initially I only saw one with a butterfly. Flowers with butterflies can be seen from quite a distance if you develop the search image for them. You can see the dark triangle of a butterfly before you recognize it as one. I did get closer, but only got a fuzzy picture. It was a banded hairstreak. 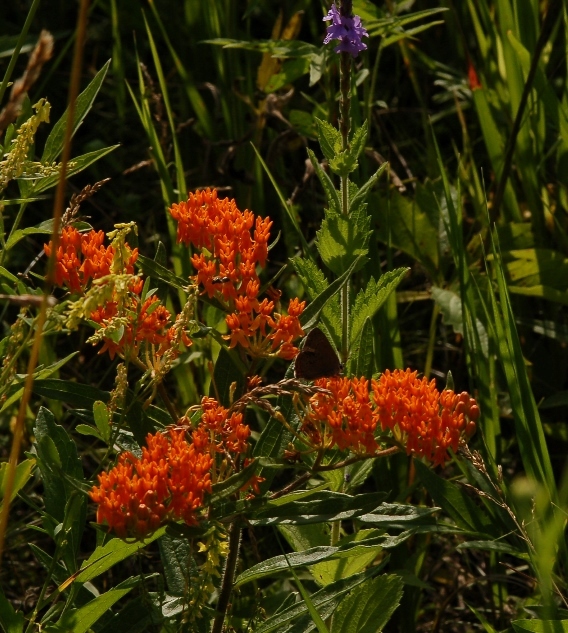 While we have hundreds of common milkweed, we only have one small plant of butterfly milkweed. I saw a hairstreak on it, but spooked it before I could get a photo. Then I went back and saw a hairstreak on it again. I was not sure if it was the same one or a different one. In fact, I thought it could be the same one I chased from the common milkweed. You have to look close to see this one–towards the right side of the flower. Once again, the butterfly spooked before I could get close. This one was a coral hairstreak–no tails, and a long red mark on the hind wing. Butterfly milkweed is much better at attracting butterflies than is common milkweed. I wish I had more. Later, I saw an eastern tailed-blue on the same flower. Butterfly milkweed makes spectacular photos. I also saw a great spangled fritillary today, making three new for the year butterflies seen today. I also removed eight dog ticks from my legs and arms. Goes with the territory, I guess. 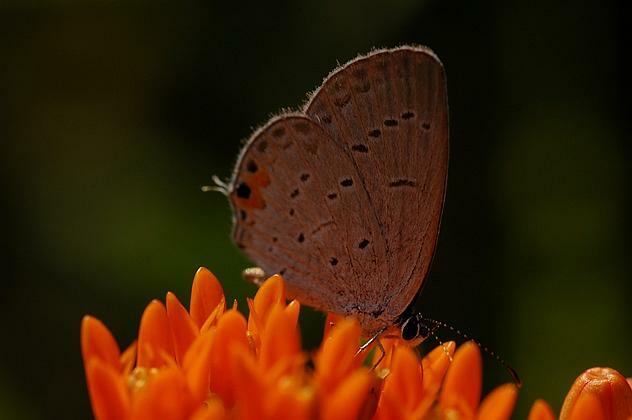 This entry was posted in butterflies, photography and tagged Asclepias, butterfly, macro photography, Satyrium titus. Bookmark the permalink.